ANNAHAGH, MONAGHAN, IRELAND – At the end of April, Irish forklift manufacturer Combilift celebrated its 20th anniversary in business and the grand opening of a new production facility. The event was marked by a massive celebration, including supply chain media from the many countries around the world where they sell their product. 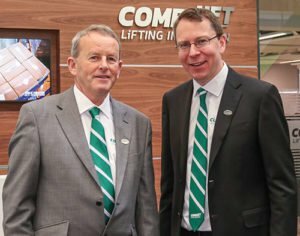 Inside Logistics was delighted to accept the invitation to see Combilift’s new home and meet with managing director Martin McVicar to learn about the company’s plans. 100 acres of land, includes 500,000 square feet of production space. The venue for this mass-custom production is Combilift’s new 500,000-square-foot, light-ﬁlled factory situated on 100 acres outside the small town of Monaghan, Ireland. Processes on the shop floor are entirely manual, which McVicar says will allow flexibility to produce the high volume of customized forktrucks their customers are seeking. In fact, the set-up will allow Combilift to double production to meet future demand. Founders McVicar and Robert Moffett (now technical director) established the company in 1998, building the world’s ﬁrst multidirectional all-wheel drive internal-combustion engine forklift. In its ﬁrst year of operation, Combilift produced 18 units, 17 of which were exported. There’s a Canadian connection: One of Combilift’s ﬁrst customers was Toronto-based building products supplier Lansing Buildall, which bought a unit in 1999. To this day Combilift exports 98 percent of its production to 85 countries around the world. The founders saw a niche market for long-load handling and for the ﬁrst 10 years, the company focused on this market, selling to lumberyards, pipe manufacturers and the construction industry. The Combilift truck’s ability to essentially turn around the load instead of turning the load around the truck meant long products could be carried lower to the ground, and not lifted over people, machinery and other product in the yard. 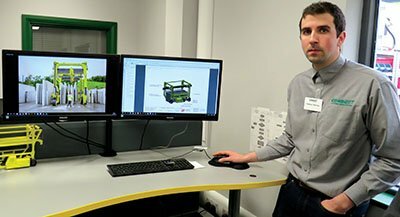 “The Combilift multi-directional forklift revolutionized the handling of long materials as it allowed customers to handle long products in less space more safely,” McVicar said. Over the ﬁrst 10 years, the company developed this niche, launching one or two new products a year. But in 2008, with the economic downturn, the construction industry went quiet. This was the catalyst for the company to look for new markets, McVicar noted. As e-commerce was in its early stages, they saw the need to make better use of warehouse space and turned their sights to indoor forklift products. Between 2008 and 2018 Combilift diversiﬁed its product range by developing products for the warehousing and heavy handling markets. For warehouses and distribution centres the company ﬁrst built the Aisle-Master articulated truck that is designed to operate in a very-narrow-aisle environment. 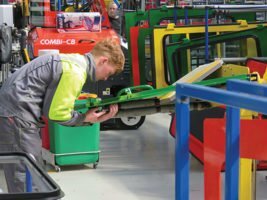 In the past ﬁve years Combilift has gone deeper into this market, designing pedestrian forklift trucks with the introduction of the Combi-WR (walkie-reach truck) and Combi-CS (counterbalanced stacker). These trucks may be used in a 72-inch aisle as the operator and the controls can pivot to the machine’s side, allowing it to ﬁll the aisle. Combilift has patented what it calls the “multi-positional operator tiller arm” technology that allows the pivot. Combilift design engineer Stephen Thornton shows visitors the 3D modeling used to develop new straddle carriers. In the heavy-handling market Combilift builds the Straddle Carrier (Combi-SC), along with a variety of massive custom machines for unique applications. These are monsters with capacities up to 100,000kg, and many are remote-control enabled. They are all custom-designed, and are used to move items like wind turbine blades, aircraft engines and concrete tanks. Most recently – at the anniversary event – the company introduced new members of the family, an order picker for long loads, and a high capacity powered pallet truck that can handle loads of 3,000 and 6,000 kg with higher capacities available on request. The company has more than doubled in the last ﬁve years and now has 40,000 machines in operation in over 85 countries. Last year it produced 5,000, 1,200 of which were exported to Canada and the U.S. More than 12,000 Combilift machines are operating in Canadian and American businesses, McVicar said. 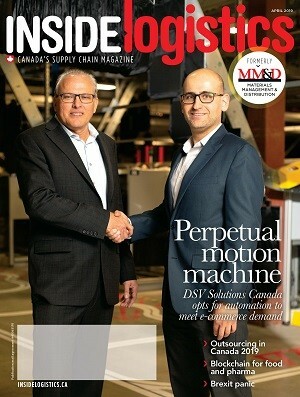 While Americans are very gung-ho from the outset, “our Canadian clients are a bit more cautious in terms of new products, but I have to say when you win a Canadian client, you win them for life,” he noted. He points out that the company deliberately intends to keep it simple, but innovative, without relying extensively on complex electronics. Combilift is counting on continued growth from our side of the pond. The aim is for sales of 1,600 units this year, a 30 percent bump from 2017, but McVicar notes they have already surpassed 36 percent growth year to date. He’s conﬁdent it will continue apace. 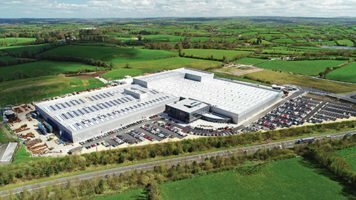 The new 46,500 square-metre purpose-built factory has 11 acres of roof space, making it one of the largest manufacturing operations under one single roof in the Republic of Ireland. Everything about it is carefully designed and looking to the future, from the shape, to the ability to reconﬁgure sections to accommodate growth. In the main stores area, where parts are held, the roof is peaked and well clear of the 40-foot racking. When asked why, tour guide Graham Moffett, normally a Middle East sales rep for the company, explained that when it comes time to grow the main stores will be moved to portable storage adjacent to the new building, and the current storage area will be converted to production. In the meantime, however, the warehousing section of the factory has 2,600 pallet positions, and a vertical carousel to manage smaller items. They serve both the production line and repair orders from this location, with 92 percent of outside parts orders ﬁlled the same day. A part will be pulled from the production line to get an existing customer’s truck up and running faster, Moffett said. 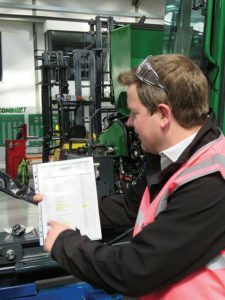 Graham Moffett shows the ID sheet that is affixed to each machine as it goes through the production line. It shows all the specifics of each machine’s unique build. Incorporating the latest manufacturing processes with a focus on sustainability, the new factory will enable Combilift to double its output in a single shift across all production lines. Four 90-metre moving assembly lines produce a ﬁnished truck every 15 minutes. Each line specializes in a type of truck. Every truck gets about 11 hours of testing, and they correct, on average, ﬁve or six defects per truck. The company spent 16 months developing its own water-based paint, to reduce the overall VOC (volatile organic chemicals) emissions. According to Moffett, fully 11 percent of the factory is dedicated to R&D. Thirty percent of its roof space is covered in skylights, enabling staff to work in natural daylight without the assistance of artiﬁcial lighting. LED lights with individual motion sensors are at the ready when it’s gloomy outside. Solar panels supply 185 kW of energy, while a 1 MW Biomass plant fuelled by recycled wood (pallets etc) provides heat for the painting booths and assembly area. More than 50 truckloads of ﬁnished products are dispatched to 85 countries each week. Spare parts are also shipped across the world from Monaghan to the dealer network. The new headquarters and manufacturing facility have been awarded ISO 9001 international quality management system, ISO 14001 Environment Management and OHSAS 18001 Occupational Health and Safety Assessment Series. McVicar noted that the company deliberately spends 10 percent of revenues (currently at US$280 million) on its workforce. “If we can keep our labour content within 10 percent of that, we believe we can be competitive exporting anywhere around the world, because if we move this plant somewhere else, all we’re going to make the saving on is that 10 percent, and when you’ve expertise here, it’s not even something to consider,” he said. An assembly line worker installs door handles on a truck by hand. And although the town of Monaghan has only 7,000 residents, with an unemployment rate of six to seven percent, the company has not needed to advertise job openings. McVicar says that being in a rural area means that many prospective employees come to the company with mechanical knowledge gained growing up on farms and working on the equipment. Being close to the Northern Ireland border gives Combilift another concern about Brexit. With 52 staff crossing the border daily from Northern Ireland, “when the Brexit vote took place in June 2016, our biggest concern was employees, that there’s no big inconvenience at a border crossing,” McVicar said. Fortunately an agreement was reached late last year that will prevent a hard, physical border on the island. “It gives our employees great comfort that there’s not going to be inconvenience getting to and from work. And, because as our business continues to grow and scale, if you draw a circle of where we are, we are going to be recruiting more people from northern Ireland, so we’re comfortable that there’s a solution there,” he added. Since they began work on the new factory in 2015 the company has added 230 positions, and now employs 550. This number includes 50 staff in North America, and eight to 10 engineers solely dedicated to warehouse design – a service Combilift provides for free to customers. The rest working at HQ are skilled technicians, design engineers, logistics and supply chain specialists and mechanical and electrical mechatronics specialists. Combilift prides itself on taking a collaborative approach to design, both of products and facilities. As noted, warehouse design is offered as a free service to clients and prospects. Sales staff will map and model a customer’s existing facility over to a narrow-aisle design and use it to show them how much they might save by converting (a number they claim can be close to 24 percent more pallet positions.). The company invests as much as seven percent of revenues into R&D each year. They work closely with clients to tweak existing products and blue-sky new ones. To adapt the Aisle-Master to cold environments, Combilift engineers brought in a group of customers to modify the truck. They ended up adding heated cabins, replacing glass with a double-layered, heated, unbreakable polycarbonate, then ﬁne-tuning the design to allow barcode scanning through the windows when they discovered the heating wires were interfering with the readers. “Some of this might seem small, but we’re willing to go down into the detail to make it easier for the customer,” McVicar concluded.